They were accompanied by bands of the Robin Hood Rifles, South Notts Hussars and various Boys Brigades and similar organisations. From the Market Place they marched along Mansfield Road to The Forest where a Salute was fired, before they returned to the City centre along Derby Road. In the evening, amongst other entertainments, there were fireworks set off from the West end of the Forest and concerts in all the public parks. While this sounds a complicated process, it seems to follow an established pattern for royal events. 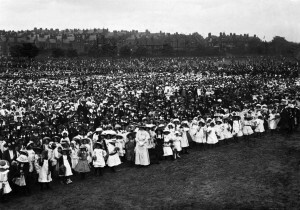 In 1887, Queen Victoria’s Golden Jubilee was marked by a gathering of 53,433 children and 4,921 teachers on the Forest, including 10,477 children aged under 6. They sang songs and were presented with a medal and given tea, and bands played in the park. This was repeated ten years later for the Diamond Jubilee and a similar pageant was planned for June 1902 to mark the Coronation of Edward VII. 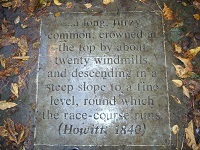 The king’s illness delayed the ceremony and most of Nottingham’s festivities, but it was decided that the fireworks on the Forest should go ahead as planned, though the ‘water fête’ on the Trent was postponed. The 1911 celebrations may have followed a tried and tested formula, but were undoubtedly an impressive spectacle. 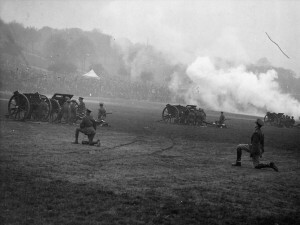 The Coronation of George VI in 1937 was marked by a Gun Salute on the Forest. 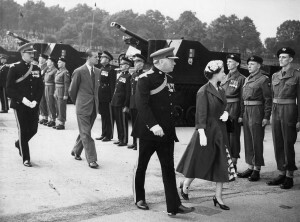 George’s daughter and our current Queen, Elizabeth II, and her husband the Duke of Edinburgh, visited Nottingham in 1955 when they inspected the South Notts Hussars.